A game that we play….what is Ron writing now? One of the things I do in my job is write contracts. Ron takes notes during the consultation about the cake design, what flavors the clients choose and any other bits of info that needs to be on the contract. When the client calls to let us know they want to use our services, I take the notes out, write the contract, Ron approves it and then I send it to the client. Do you know what Ron wrote? With handwriting like that, he could have been a doctor. 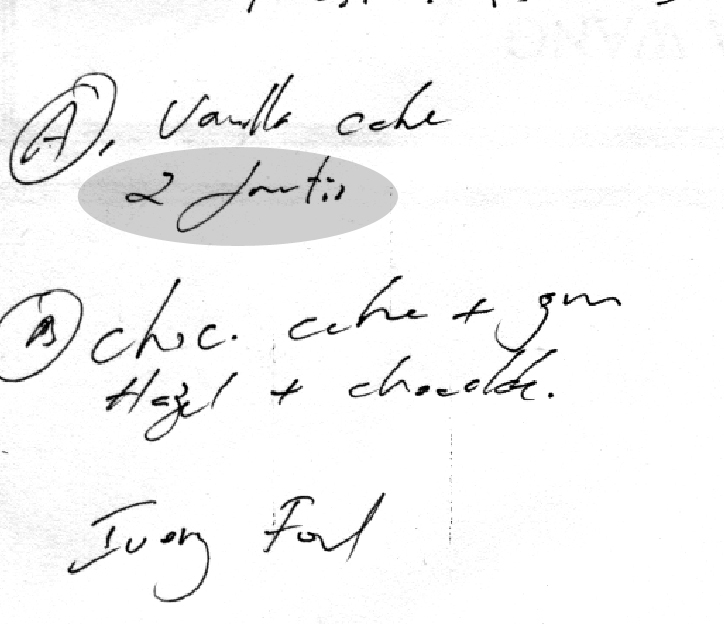 It says “Call the client back and say we just wanted to follow up and confirm your flavor choices.” Tricky one. You could say the “dog” ate the notes. B. chocolate cake + ????gm??? I have been lookingat the word for the last 5 minutes and still have no clue. Maybe is in Hebrew . I agree with this one, but I think they want hazelnut and chocolate (the plus sign can be interpreted as and). He could be a doctor!!! !